The Antioxidant serum that offers environmental protection and anti-aging benefits for the skin. after cleansing and toning, apply 3-4 drops to face, neck, and chest before any other skincare products. Its oily basis has a lipid profile similar to that of human skin that guarantees effective nurturing. after cleansing and toning, apply 3-4 drops to face, neck, and chest before any other skincare products. Its bactericide effect might produce a slight redness that will disappear in few minutes. A healthy hair involves a balanced scalp. And Tergum´s expertise when it comes to care about skin means an advantage. Hair loss is in most cases related to a missfunction of the sebaceous gland: the sebum that was meant to protect both scalp and hair can drown the hair follicle if produced in excess. 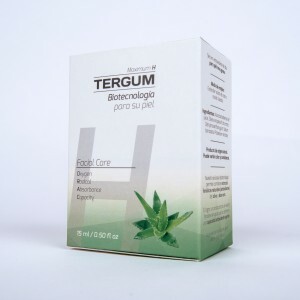 Tergum has patented a Cucurbitaceae extract that calms the sebaceous gland and so helps to control hair loss.It is marketed under the name Sana Capilar. Sana Capilar shampoo and serum. Sana Capilar 1: cleans thoroughly the scalp, releasing the hair follicle. Sana Capilar 2: the patented Cucurbitaceae extract calms the scalp to prevent sebum overflow. There is also a serum based on the patented extract that can be applied with ozone vaporizer. This enables beauty professionals a treatment (4 to 8 sessions) that will balance those scalps that are so damaged that cannot be easily balanced with the shampoo alone. 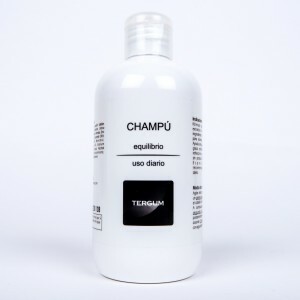 For those who do not suffer hair loss but want to have a shampoo that makes the most of their hair, Tergum has designed this shampoo. Again, the secret is balance. 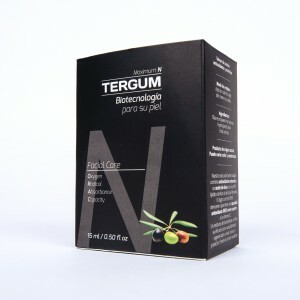 Tergum has included several active ingredients that help achieve the best balance. And the hair lets you see the difference.